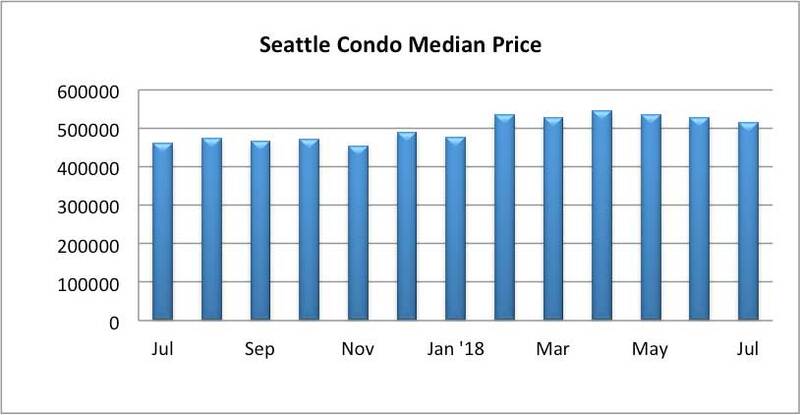 Seattle condo values rose year-over-year by 11.26% to $514,000. 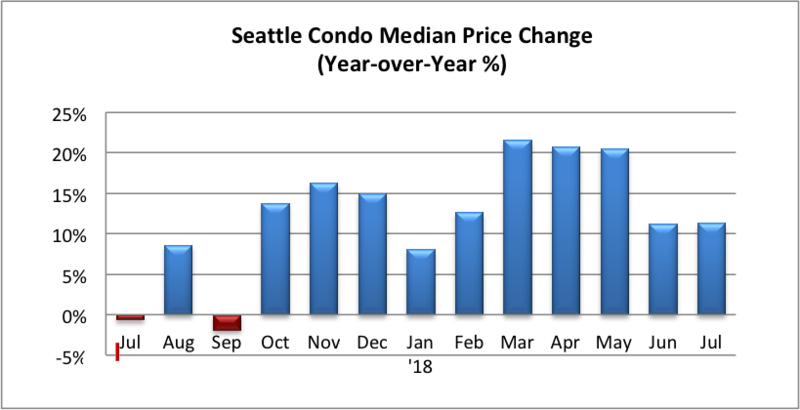 However, it was 2.6% lower than June and it also reflected the 3rd consecutive monthly decline of the citywide median sales price. 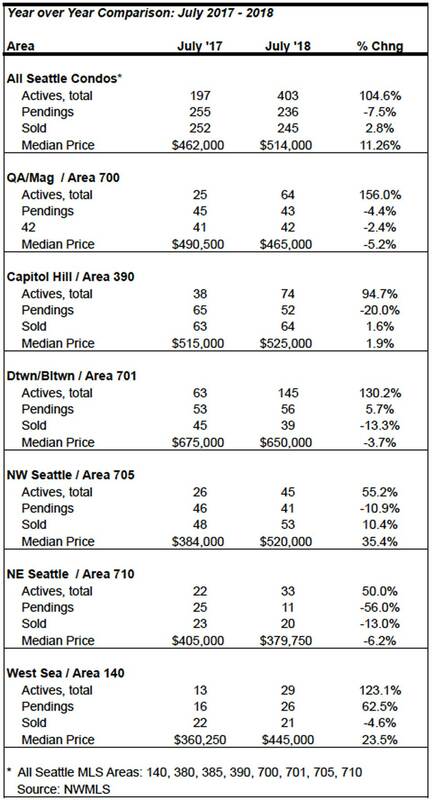 For the month, NW Seattle (Ballard) and West Seattle realized double-digit increases while downtown, Queen Anne and NE Seattle reflected decreases in selling prices (see table at bottom of post). 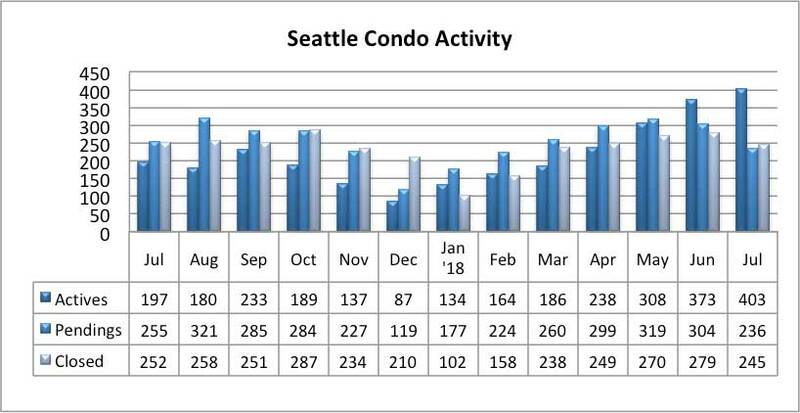 Inventory of Seattle condo units listed for sale skyrocketed for the second month in a row, rising 104.6% to 403 units compared to a year ago. That’s also 8% more than were available last month. 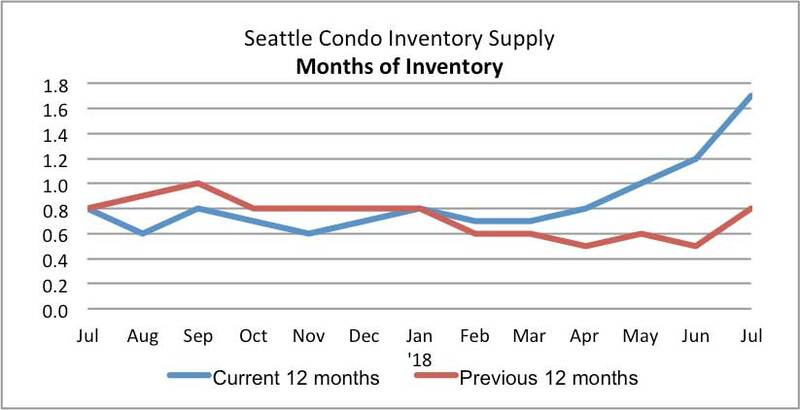 With the greater number of active listings (combined with fewer sales), the inventory supply rate rose to 1.7-months of supply last month. 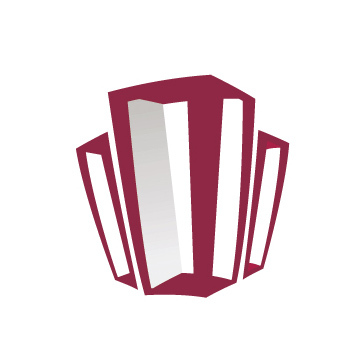 That still keeps us firmly in a Seller’s market, which is characterized by having less than 3-months of supply. 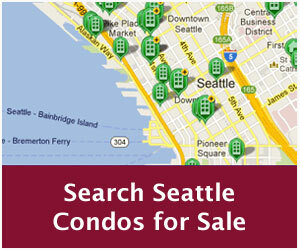 At the current rate of sales, we’d need to hit at least 700 listings per month to reach normal market conditions. However, seller are starting to feel the effects with longer market times, fewer multiple offers and more instances of price reductions. 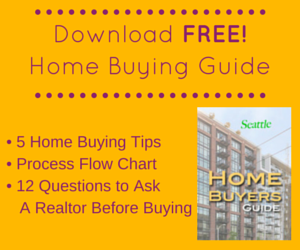 That gives buyers some breathing room with a little less pressure of bidding wars, price escalations and giving up contingencies. Even though buyers are starting to gain the advantage in the market place, they’re cooling off from pulling the trigger…at least in July. 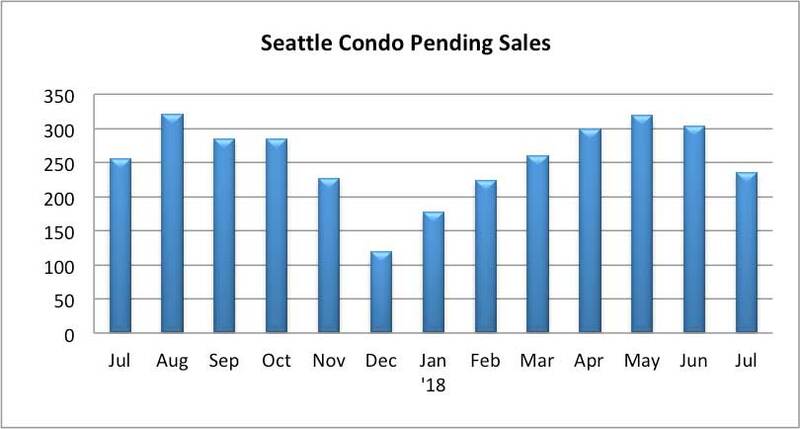 Condo sales, or pending sales transactions (listings with accepted offers), fell in July by 7.5% compared to a year ago and by a rather significant 22.4% from the prior month. That’s somewhat disconcerting given that listings had spiked 139% in June as well. 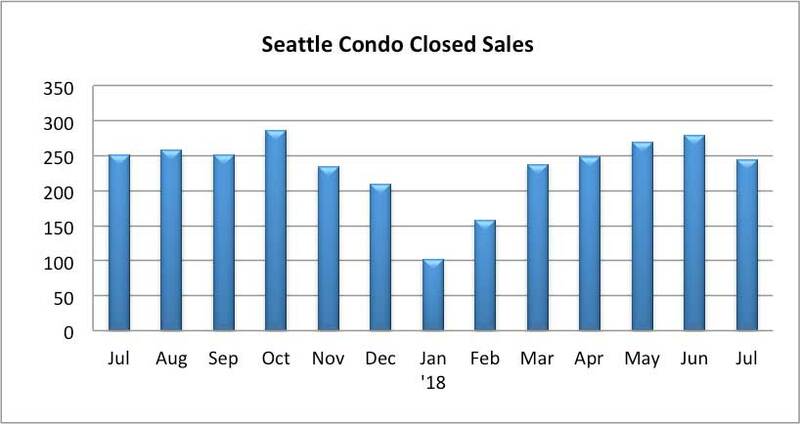 The number of closed Seattle condo sales also decreased, dipping to 245 units, reflecting a 2.8% year-over-year and 12.8% one-month decline, respectively. It does feel like the fall housing season has come a few months too early. 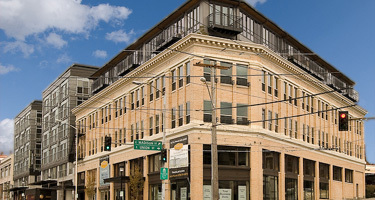 Real-estate experts pointed to a variety of factors driving the cool-down: Rents have stabilized, putting less pressure on first-time buyers to get out of their apartments. Mortgage rates are at their highest point in years, eating away at buying power. Population and job growth in the region, while still strong, has waned. Some agents have reported falling interest among Chinese buyers. Brokers on the ground also report a bit of buyer fatigue after an unusually fast winter market zapped the energy of buyers who are now bowing out. And prices have gotten so high that the pool of potential bidders is lower than it used to be.